Home » Posts Tagged "Block Grants"
Rep. Blaine Finch, right, speaks during a meeting of a House-Senate committee starting work on the Legislature’s response to a court order on school funding. At left is Rep. Ed Trimmer. The first meeting of the Special Committee on a Comprehensive Response to the School Finance Decision (how’s that for a committee name!) met for the first time yesterday. They will meet again for two days on December 18 and 19 in advance of the 2018 legislative session. Committee members are Rep. Blaine Finch, Chairman (R-Ottawa), Sen. Molly Baumgardner, Vice-Chair (R-Louisburg), Senators Jim Denning (R-Overland Park), Anthony Hensley (D-Topeka), Carolyn McGinn (R-Sedgwick), and Rick Wilborn (R-McPherson) and Representatives Larry Campbell (R-Olathe), Steven Johnson (R-Assaria), Ed Trimmer (D-Winfield), Troy Waymaster (R-Bunker Hill), and Valdenia Winn (D-Kansas City). As Chairman, Finch runs a tight ship, sticking to the agenda and the timelines specified in the agenda. SB 19 created a new school finance formula that is very similar to the formula in effect prior to its repeal in favor of the Brownback block grants (the CLASS Act). It increased school funding by about $292 million. KSEEA also made several modifications to the equity provisions in the school finance law. The Supreme Court on October 2, 2017, ruled that the KSEEA was unconstitutional both in terms of adequacy and equity. The Court noted that structurally, the bill was constitutional on adequacy but in implementation was unconstitutional. It was noted that the $292 million in new funding was an “outlier” when compared to other analyses – the Plaintiffs averaged the two cost studies done for the legislature and came up with a figure of $1.7 billion, the State Board of Education budget request was for $893 million, and the earlier 3-judge panel calculated $819 million. We should note that the original version of SB 19 as drafted by Rep. Melissa Rooker (R-Fairway) and Sen. Laura Kelly (D-Topeka) would have provided $750 million in new funding over three years. a provision setting a 10% floor for the distribution of at-risk funds. The Committee spent the morning reviewing all of this Court and legislative history. In the afternoon, Finch led the committee in a discussion of what remedies might be options available to the legislature and what information the committee members would need to consider those options. Finch made it clear that nothing was off the table. Committee members should feel free to bring any ideas forward and suggesting a possible option would in no way imply an automatic endorsement of that option. what are the implications/challenges of requiring all LOB increases to have been and continue to be subject to a protest petition? The new data will be used in guiding discussions at the next meeting. The Joint Committee on Pensions, Investments and Benefits met on Monday, November 27. On the surface, the committee’s agenda was at best perfunctory and at worse a forecast of another four or five hours listening to and digesting reports regarding Bond Proceeds and Valuation charts while sitting on wooden chairs. In the background of most any meeting at the Statehouse lurks the issue of school funding. Where will the legislature find the revenue to appropriately fund schools? We know some legislators have taken a stand against raising taxes to increase funding for schools and some are against complying with the Supreme Court ruling at all. These factors leave the path to solving the school finance problem somewhat murky at best. So, where does the legislature find additional revenue without raising taxes or cutting other vital programs? The legislature has already used up the Bank of KDOT (the highway fund). What money could possibly be available to help solve the school finance issue? How about the bank of KPERS? The legislature cannot legally take money from KPERS that has been deposited in the system, so that money is safe. BUT, they can reduce the funding stream to KPERS to offset money needed to fund schools appropriately. Much like robbing the armored car filled with deposits on the way to the bank, the legislature could take the money BEFORE it is deposited into the system. Appropriations to KPERS can be reduced as they have been in the past. The legislature has a history of reducing KPERS payments to fund government when revenues do not meet expectations. KPERS payments were diminished to help fund government responsibilities during the failed Brownback tax cuts. Current KPERS retirees and actives will receive their benefits. Current earnings on KPERS accounts are equal to or greater than current payments to KPERS retirees. The State/School statutory employer contribution has been below the actuarially required funding for 24 years – meaning the legislature has underfunded KPERS for 24 years. The payment of the FY 2016 employer (the state) contribution reduction ($97.4 million plus promised interest) that was scheduled to be paid on June 30, 2018, was eliminated. FY 2017 employer (the state) contributions were reduced by $64 million but will be repaid over 20 years starting in FY 2018. The first payment has already been made. FY 2019 employer (the state) contributions are reduced by $194 million but will be repaid over 20 years starting in FY 2020. The state needs to pay $623 million each year to stay even regarding their commitment to funding KPERS and not add to the underfunding of the KPERS system. The KPERS system is currently in better shape than it has been in past years due to excellent investments and returns by the KPERS staff, the influx of bond money, and the increased contribution rates by the state and current active members. The question posed by one of the committee members highlights the situation. “What would the legislature’s payment to KPERS be if we had paid our bill?” Remember, it currently requires $623 million just to stay even and not put KPERS further in debt. The answer is, if the legislature had paid what was owed to KPERS, they would be making a $100 million payment each year instead of something north of $623 million. We are already currently paying bills due for previous year’s lack of payment to KPERS. A generation is considered to be 20 years. The legislature has underfunded KPERS for the last 24 years. We are the next generation paying the bills for the last generation. We have the clear feeling that this legislature is desperate for money due to the school funding decision. If they kick the KPERS debt can further down the road, it will be our grandchildren and great-grandchildren paying the bill for the current/near future actions of the legislature. Add to that scenario the Brownback tax cuts and we can see upfront and personally the cost of those “cuts”. Clearly, it is not appropriate for the legislature to reduce their commitment and contributions at a time when the KPERS system is just now returning to fiscal health. The Supreme Court of Kansas has issued a ruling in the Gannon school finance lawsuit late this afternoon. Usually rulings are released by about 9:30 on Friday mornings. The ruling, which we are still reviewing, finds that the equity bill passed by the Kansas Legislature during this year’s legislative session meets the requirement for providing equity within capital outlay but does not meet the equity requirement within the local option budget (LOB) and supplemental general state aid. The Court also finds that the LOB and supplemental general state aid are not severable from the block grant funding bill known as the Classroom Learning Assuring Student Success Act (CLASS Act). For this reason, the CLASS Act block grant funding scheme is effectively unconstitutional. It does not appear that the Court is giving the state any time beyond the June 30 deadline to solve the problem. It is most certain that this will be a focus of legislators under the dome during the sine die session which is normally just a ceremonial event. 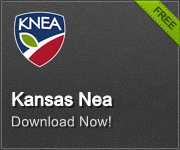 KNEA has long held that it is the responsibility of the Kansas Legislature to fulfill its constitutional obligation to fund public schools equitably and adequately. We continue to call on the Kansas Legislature to meet its constitutional obligation so that public schools will be open as expected this coming fall. KNEA’s Governmental Relations and Legal staff are reviewing the decision and will have a more comprehensive update next week. The Kansas Supreme Court heard from the state and from the plaintiffs in the equity portion of the Gannon School Finance lawsuit today. The hearing took about 2 ½ hours. Attorneys for the state were questioned first. They defended the block grant funding scheme passed by the legislature (SB 7) and asserted that the money the legislature had appropriated for the equity resolution last year was appropriate to meet the requirement. The money that had been appropriated was about $138 million but the final cost was closer to $200 million. The state argued that the money appropriated was based on what they were told by the State Department of Education. KSDE had provided an estimate of the amount that would be needed based on the prior year’s data – the only data available at that time. Attorneys for the plaintiffs maintained that it was long past time to resolve the issue and that the repeal of a constitutionally sound but underfunded school finance formula was an inappropriate action by the legislature. Questioning of both sides by the justices was pointed but it was difficult to tell with any certainty what position they might be forming. We don’t know when they will make their ruling but most expect it to come early in the session. The issue of adequacy is still to be resolved. A special Joint Committee on Taxation spent the last two days learning about the challenges of sales tax policy and tax credits. The committee studied the history of the sales tax in Kansas and reviewed Legislative Post Audit studies that have been conducted on sales tax exemptions, tax credits, and economic development incentives. They took public testimony today. Shawnee Mission Superintendent Jim Hinson gave them much food for thought regarding Tax Increment Financing Districts (TIFs) which have the potential to stress the budgets of school districts – particularly growing districts like Shawnee Mission. KNEA lobbyist Mark Desetti testified, urging the committee to reign in the granting of sales tax exemptions by developing guidelines under which an organization would be eligible for such an exemption. Today these exemptions are generally granted every time an organization comes before the committee with a pitch leading to an enormous laundry list of individually named organizations with exemptions. 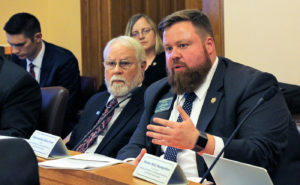 A coalition of non-profit organizations urged the committee to proceed cautiously while the Sisters of Charity made a plea for the preservation of the Earned Income Tax Credit which applies to the lowest income Kansans. The Kansas Livestock Association and Farm Bureau both spoke on behalf of rural and agricultural interests in the state. The Senate has just passed the block grant bill that repeals the current school finance formula. The biggest decision of the session – the funding of our public education system – was ramrodded through the legislative process in just seven legislative days. The process denied Senators the opportunity to offer amendments; they could only debate and question. The vote was 25 to 14. Senators Pyle and Knox had initially passed but changed their votes to YES. Senator O’Donnell is out of state. The bill now goes to the Governor for his consideration. No one doubts that he will sign it. We will report the actual voting record when it becomes available tomorrow.